The real-life story of Aron Ralston's terrifying experience of being trapped in a Utah canyon. 127 Hours is an unusual film based on a very unusual true story. Though it never really found its audience in theaters, it may find wider appeal on Blu-ray. The film received six Academy Award nominations, including Best Picture, Best Actor (James Franco), and Best Adapted Screenplay. Franco stars as Aron Ralston, a mountain climber who was trapped in a Utah canyon after a large boulder pinned his arm to a wall of rock. Ralston’s 2004 autobiography Between a Rock and a Hard Place served as the basis for the movie. After more than five days, Ralston’s only option in order to survive was to amputate his own arm. To say this is an extraordinary story is an understatement. Ralston’s will to live will likely leave viewers asking themselves, “Could I have done that?” As uniquely fascinating as the story is, I wondered how it would translate to movie form. There isn’t much backstory provided about Ralston, nor are there many significant supporting characters in the film. We see Ralston gearing up for a biking excursion in Utah’s Canyonlands National Park. He doesn’t tell anyone where he’s going for the weekend. A bit of an obvious daredevil, Ralston practically attacks the rugged terrain with his bike. When he takes a nasty spill that would lead most people to take great caution, Ralston laughs it off and keeps going. After a brief encounter with a pair of female hikers, played by Amber Tamblyn and Kate Mara, Ralston triggers the accident that immobilizes him for most of the movie. After he falls into a relatively shallow area of Blue John Canyon, a boulder tumbles down after him. With his right arm firmly lodged between the boulder and canyon wall, Ralston contemplates his very existence. This is where James Franco’s performance – which began as a portrait of youthful exuberance (and arrogance) – becomes mesmerizing. Recording his thoughts with his slowly dying camcorder, he becomes slowly enveloped in a haze of hallucinations, memories, fear, and physical exhaustion. Director Danny Boyle, winner of the 2008 Academy Award for Best Director for Slumdog Millionaire, had his work cut out for him. In the supplements for 127 Hours, which he co-wrote with Simon Beaufoy, he describes it as “an action movie with a guy who can’t move.” Through split screen, flashbacks, and time lapse effects, Boyle keeps the movie consistently interesting. He holds nothing back in his staging of the climatic amputation, which was given a medically accurate depiction. It’s a harrowing capper for a genuinely nightmarish film, guaranteed to provoke astonishment. 127 Hours looks stunning on Blu-ray in 1080p/AVC-encoded high definition. Having visited Canyonlands National Park several times, I was looking forward to seeing how the region would be represented visually. The level of detail is breathtaking, with the red rock canyons appearing vividly realistic under clear blue skies. Shot with digital cameras, the images are flawless. The rocky textures, whether shrouded in clouds of dust or drenched in a raging flash flood, provide a visual treat even when not much is happening onscreen. Extreme close-ups of Franco reveal a high level of detail, seen in individual specs of sand on his face. The film’s very inventive sound design is well represented by the DTS-HD Master Audio 5.1 mix. The audio in 127 Hours is a combination of extremes. Due to the nature of the story, much of the movie is very quiet. But there are bursts of sonic activity that make effective use of the surround channels. Music plays a big part in the sound design, and the songs as well as the score sound terrific. Some of the music is so prominent, such as a key sequence with Bill Withers’ “Lovely Day,” it borders on bombastic. But it’s all intentional and serves as a striking contrast to the whisper-quiet scenes where Ralston contemplates his fate. This is a dynamic mix that delivers a thoroughly satisfying experience. Included among a notably valuable set of supplemental features is a thirty-four minute block of deleted scenes. The bulk of that running time is devoted to an alternate ending that runs just over twenty minutes. It basically extends the ending point seen in the completed movie to include a bit of Ralston’s life beyond his ordeal. A worthwhile thirty minute documentary gets into the technical details of how the film was made. Perhaps best of all is the fifteen minute piece, “Search & Rescue,” that sheds light on the real-life search for Aron Ralston that was concurrent with the events depicted in the movie. Ralston himself, along with his mother, Search and Rescue personnel, and other key figures participate in this informative featurette. Director Danny Boyle provides a commentary track for the film, accompanied by the film’s producer and co-screenwriter. 127 Hours is a must-see film simply because the true story being told must be seen to be fully believed and appreciated. From a technical standpoint, the Blu-ray a truly exemplary example of what the format is capable of. With its breathtaking high definition cinematography and richly detailed sound design, this is a demonstration disc for anyone unfamiliar with Blu-ray. Also included is a second disc containing a digital copy intended for downloading the film to portable media players. An old co-worker of mine thought my name was Chad. Since we had two Chads working there at the time, I was "The Other Chad." 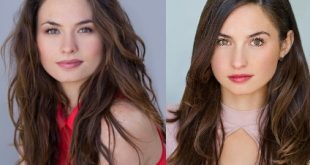 Twin sisters Laura and Sarah Bellini have built an impressive acting career together and will star as the twin Winklemann sisters in the upcoming ten-episode series 'Trust' (premiering on FX on Sunday, March 25) and discuss their daily lives, acting processes, and future plans.